LAKE MACBRIDE— Six pounds of tart cherries from Michigan were buried below frozen corn, eggplant and broccoli in the freezer drawer. The cherries were frozen in one bag, so I thawed them and separated and strained the liquid to use in a separate dish, and make coffee cake with part of them. 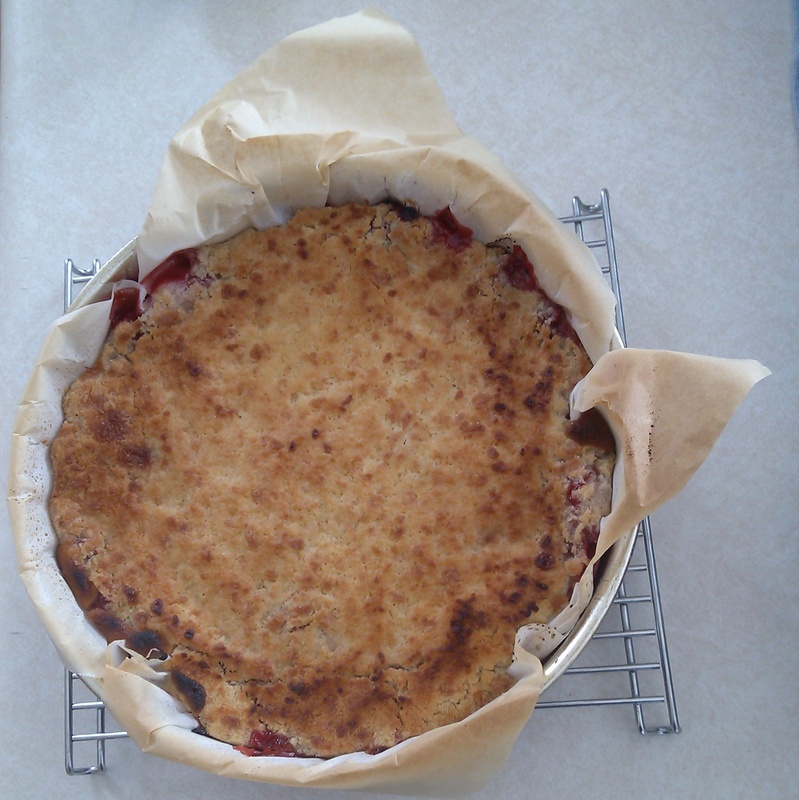 The recipe calls for one can of cherry pie filling, but substituting fresh frozen cherries takes only a bit of preparation. In a large pan, measure three cups of pitted cherries and place on medium heat. Add one half cup of honey, a tablespoon each of white flour and corn starch, and a scant teaspoon of cinnamon. I’m from Iowa, so I use corn starch, but other thickeners will work, including potato starch, arrowroot, or flour only. Stir gently until the mixture thickens completely and set aside to cool. The batter is in two parts, the cake and topping. Cake dough: Cream one stick of softened, unsalted butter with one cup of granulated sugar in a mixer. On low speed, add two cups of white flour and one teaspoon baking powder. Mix thoroughly and add 3/4 cup of milk. When the ingredients are thoroughly mixed, press the dough into a greased, spring form pan. I line my pan with parchment paper, but that is optional. Topping: Cream one stick of softened, unsalted butter with one cup of granulated sugar in a mixer. On low speed, gradually add one cup of flour and mix until the dough turns into crumbs. Pour the cooled cherry mixture on the dough in the pan and sprinkle on the topping. This entry was posted in Cooking and tagged local food, recipes. Bookmark the permalink.